Welcome to a new series on the blog! I’ve always been a fan of snail mail (I had pen-pals when I was younger!) and recently found out about Postcrossing. It’s a community where people send and receive postcards from all over the world! Chris and I get so excited when we receive new postcards that we’ve decided to share them on the blog, so ta da! These were my first two postcards through Postcrossing. One came from Chicago, IL and the other one from China. I really love the postcard that came from China; I think it’s a perfect representation of what their culture has to offer. That postcard did bring back memories of my grade-school days studying Mandarin. A lovely couple from Netherlands sent a postcard together. They also wrote a phrase in their language but I couldn’t read their penmanship so I’ll never learn that phrase. It got scratched in the mailing process which gave the man in the postcard a weird mustache. I loved the little story written on the postcard from Portugal! She wrote about how she saves homeless animals on her days off from teaching – I think that’s amazing. I always admire people who do things like that. It’s important to give back! Lisa from Germany wrote about how she’s currently studying computer science in her hometown, and how the card has lots of miles to travel before arriving to me. The little postcard I received from Indonesia was the first postcard she ever sent! I felt a little special when I saw that. The postcard from Bulgaria has a special place in my collection like the one I received from China – I mean, oddly shaped cards should be seen more often! Also, Kalina from Bulgari sent me a little pin which they wear throughout the month of March to bring good luck and fortune. Her card took 51 days to get to me – crazy! 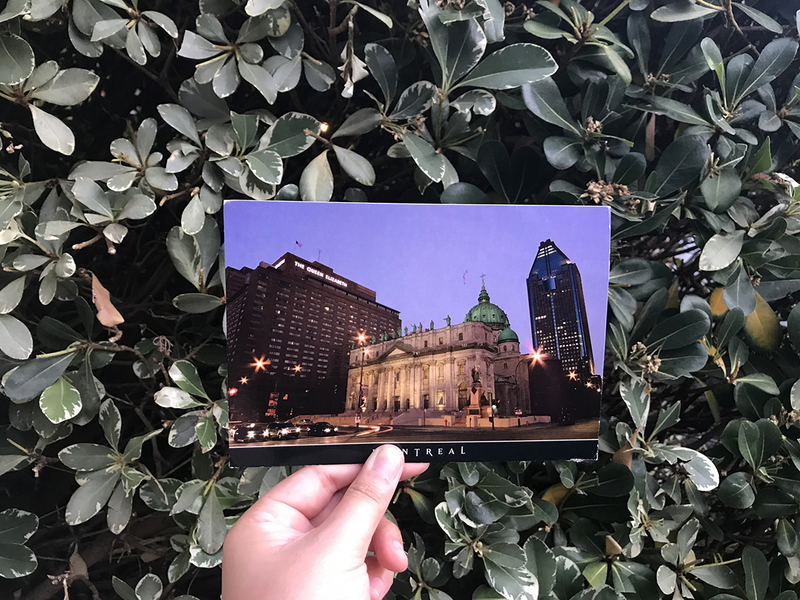 My cousin, Angie, recently spent spring break in Montreal, Canada and sent me a postcard from her trip! I told her about my Postcrossing postcards, to which she replied with “Oh darn, someone one-upped me on the postcards!” I love her so much. We spent the winter/Christmas holidays together last year and I’m looking forward to more adventures together (she and her younger sister, Krystle are my maidens of honor for the wedding next year!). P.S. How beautiful are my backdrops? Anyone notice I have new backdrops now besides the hedge?! It’s so cool that you’ve joined Postcrossing and received some cool postcards around the world. The one from China looks gorgeous! I really like the unique shape and it’s a good representation! The Pixar one is cute. Reminds me of Disney’s new Pixar Pier addition! You could always use the google translate app on your phone and take a picture of the postcard for a translation! Wow, 51 days is a lot! These postcards travel FAR! Haha, your cousin is so cute for sending you one! I noticed the backdrops!! I was like… This is genius. Who needs to buy faux fur rugs LOL (ME). Keep on sending postcards!!! I really loved this post! I think all the postcards you received are really lovely! This is such a cool concept! I think it’s great that you’re able to connect with a range of different cultures through snail mail. I also think your natural backgrounds are really nice! Great post! Great post! I hadn’t heard of postcrossing before, but it seems so neat! I’ll definitely have to look into it! What a lovely idea for a post! Those postcards are so lovely and quaint. I love the Portuguese one! It’s stunning. I’ve never heard of this but I love the idea of it! I’m definitely going to check it out because it looks so cool and I love the idea of getting a little piece of someones culture from the other side of the world or even only a couple states away. Great post! I’d never heard of this before but it sounds fab! I’ll definitely look into it as I think it would be amazing to receive postcards from all around the world and read about the lives of the people who’ve sent them! Oh wow what an amazing hobby! Such a cool way to keep in contact with people from around the world, I bet you hear so many cool stories! I’ve never heard of this before but it’s such a lovely thing, I think I’m going to look into it! And all those postcards are so gorgeous! Wow this is such a great idea!!! I love the personal messages written too, facts about their country and so on. I’m totally going to check this out! The postcards look so pretty. This is such a great idea! I love the personal messages and the cards look all so pretty! Can you send me a postcard? I’ll send one to you!!! This is such a cool idea! This is such an amazing idea! I used to write lots of postcards in the past. It is so nice to receive mail from people all over the world! I never been a fan of postcards but seeing this makes me want to collect. What a cute idea! I’ve just signed up, going to go hunt down a postcard to send! What a cool thing to be a part of! Love all these pretty postcards. Thanks for sharing. omg this is so cute I loveeee it! In elementary and middle school, whenever my family and I traveled, I would always come back with souvenirs for friends, and of course souvenirs for myself as well. But starting high school, I realised that my room was getting too cluttered and that I never went back to use or look at my souvenirs, so I stopped buying souvenirs. At the end of high school, I started taking up photography, so photography and blogging became my souvenirs. I loved photography and blogging because they were memorable, meaningful, gave me so much more joy, and saved space too haha. All of those postcards are so nice and pretty, that sounds like such a cool hobby to have so interesting! This is so cool! I love getting cards, and i have been thinking about signing up for this. Getting snailmail is so much more personal and nicer than just an email or a printed letter. Omg I love this! The concept is amazing and it’s just simply lovely to write and receive hand written cards! Each one is so pretty and would be so good to display them all over the walls! This was such a lovely post to read and you truly have received some stunning postcards. It’s so interesting to see such a variety of postcards but I think my favourite of your collection would be the one from China. I’ve never heard of post-crossing but it seems like such a great community to be part of, and receiving a postcard could really make someone’s day. I love this, thanks for sharing such a lovely post, the postcards are just the cutest. This is so cool! I hadn’t heard about Postcrossing before but it sounds so fun! Can’t wait for you to receive my letter and postcard soon! They’re all so pretty, I think my favourite is the Chinese one because it’s not just a square! I can’t believe how many postcards you have received! Eena, this looks so fun! I still have your card sitting on my shelf. I’ve never heard of Postcrossing before, but seriously considering it. It’s cool to realize that every piece of paper you’ve received has traveled so far and been created by a melting pot of people. I’ve never heard of Postcrossing, but this is so cool! I love the different postcards. I had never heard of Postcrossing before but I love the concept. And it is such a great way to learn about other cultures. I think that my mother would love this! I haven’t heard of Postcrossing – it is such a cool idea! I got excited only from seeing the postcards you received! You get something signed and bought on the other side of the world! Will try it as well! I used to collect postcards as well (before social media). Guess that nowadays they have become even more special since people send them less frequently. I love the Bulgaria card because I’m from there, but live in the USA. Made me so happy seeing it! I’ve never heard of post crossing before, but like you I love snail mail so I’ll definitely need to check this out. Your different post cards look so interesting!! This is such a cool hobby, first time I’ve heard about Postcrossing. I also had lots of penpals when I was in elementary and high school in the Philippines. I remember I always looked forward to the mail man stopping by our house and giving me my letters. This is like going back to the simple old days. Nice of you to discover Postcrossing, I also thought the cards with the shape of the countries are the cutest. Have a fun weekend Eena! Wow I’ve never seen something like that! Wow I’ve only found out about this hobby right now. Thank you so much for sharing this! I’m glad you’re enjoying your new hobby. This post made me feel nostalgic because handwritten letters really feel more special than talking to people on the Internet. I love that these postcards are creative, too! I’ve heard a little about postcrossing but I never really got into it. I have a few penpals but you’ve made me want to start postcrossing too. Omg what a cool concept! I also had a pen pal when I was younger; I love snail mail!! These are all such beautiful post cards. I want to get involved with Postcrossing now!!! Wow I have never heard of postcrossing but it is so cool to get to receive/see the postcards from all over the world. The postcards look so cool!! I especially love the ones from Europe. they look like old photographs and paintings. This is the first time I’ve heard of cross posting and it seems like a really cool thing to try. Thanks for sharing. I love these!!! I have never sent a snail mail (sad, I know, what a millennial) and these look awesome. I also love the idea of getting postcards from strangers, who eventually become your friends, across the world. It’s like meeting new people and having a tangible connection without leaving your place. I hope postcrossing is available here in PH. Eena, I love the concept of postcrossing! Thanks for letting us know about it. Postcrossing reminds me of the international pen pals I had in junior high school. I looked forward to the snail mail each day. Connections with the wider world is a good thing! Oh my gosh, this is so cool! It is definitely a great way to connect with people all over the world. I’m really loving all these beautiful postcards, and your backdrops are so perfect! Thanks for sharing! Postcrossing? First time I ever heard of it! I think I love the idea. Actually, I’ve been thinking about finding a panpal for a while now (just to get to know someone completely random, to whom I can share my life) but then I simply set-up a blog. I have to check out this site, it seems very cool. Great post, thanks for showing me something new! Ps. the postcard from China is really the best one of all. How cool is this!! And I love your photos of the post cards. When I was a kid my mom told me about something called pen pals. I think it is where two young people from different countries would write to one another and tell them about their lives. Boy if they could have seen the future!